It was exactly one year ago that Austrian stuntman Felix Baumgartner jumped from the edge of space in a leap that had millions around the world on their edge of their seats as he sailed, spun, and then sailed again, back to Earth. To mark the first anniversary of the incredible record-breaking 24-mile (39 km) leap, his Red Bull support team has released a POV video showing his rapid and, let’s not beat about the bush here, terrifying descent. The remarkable footage, captured by a number of cameras attached to his space suit (below), starts off peacefully enough, with a beautiful view of the Earth and space. Fifteen seconds in, things get noisy as Baumgartner rapidly gathers speed, his heart racing at 167 beats per minute. Now, if you were freefalling to Earth at 630 mph, the last thing you want to do is start spinning out of control. But 34 seconds in, that’s exactly what happens, placing Baumgartner at great risk of losing consciousness or having his oxygen supply cut off. During this critical period, the daredevil hits 843.6 mph (Mach 1.25), becoming the first person ever to travel faster than the speed of sound without the aid of a vehicle, though breaking records was probably the last thing on his mind at that particular moment. 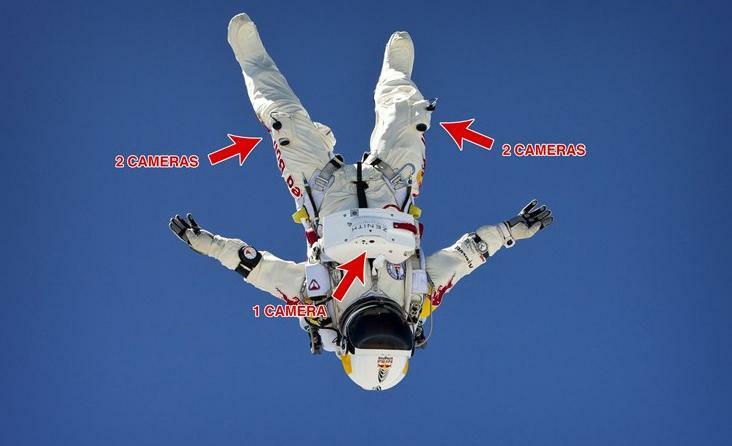 At around the 90-second mark, at an altitude of 18,000 meters (60,000 feet), the situation begins to settle down for Baumgartner, allowing him to enjoy the descent instead of worrying about dying in front of a global audience of some eight million people. At 4:20 he opens his parachute – listen carefully and you can hear him shout “rock ‘n’ roll”. A few minutes after that, he executes a perfect landing. Best viewed full-screen in HD, the nine-minute leap is a fascinating watch, particularly those first few minutes where pretty much anything could’ve happened.